I remember when I first made my way between the vast and conquering peaks of ice-cruel, unyielding. I was young then, innocent. But innocence never lasts, not in this cruel world. I knew not of sorrow, nor pain but that of grazed knees or scraped elbows. Nestled amongst the hay bundles and pelts that crowded my fathers old cart-rickety, aged. Too young was I to remember as the life slipped away from my mother’s warm face, like the sun melting behind the hills into shadows-unheard, unseen. See Zipfile for the rest of the story. -	3 invisible sign posts. Hey WL_D. When did you submit your last map? How did you make invisible signposts? Quite a while between releases. To create invisible sign posts you simply use the magic eraser. we realy need more maps like this! This map by WL_D is extremely excellent, a must download by all players of freebuild maps. You have perfect resources and the landscape is truly stunning! I built a massive stronghold and then sieged it to death (as I always do on freebuild maps). The AI were pretty good, but they neglected building siege weapons on most of their attacks. Truely spectacular! Your mountains give the impression of being huge, which is quite an achievment in the Stronghold editor. Everything about this map is perfect, I spend 10-20 minutes just exploring every nook, cranny, gorge and mountian on this map. I can't wait to build a huge castle and settlement. Glad you all like it. We also just realised we forgot to change the troop restrictions, feel free to alter this if you wish. Wow..........THIS was the breath of fresh air I've been waiting for. I'm glad to see that not all the greats have left this site. Oh yes, I noticed that myself, the troop restrictions I mean. They didn't bother me much though. In freebuild I much prefer archers over crossbowmen and swordsmen or pikemen over macemen. I think the playability and balance categories on freebuilds should be removed lol... ridiculous. Though, it was kinda fun with the soldiers around the campfire. Alot of creativity is seen in the map design, and terraining! Need I say more? Stunning as usual. 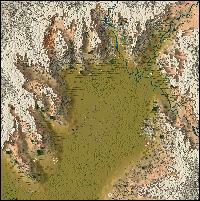 In fact, this might be your best terrained map yet. The snow, and the mountains gives such a powerful feeling. It looks incredibly realistic. Unlike most freebuilds, this is one accompanied by a story at the level of those that comes with most invasion maps, and really good one too! Probably a wierd comparison lol, but it's a really good story as usual. Exactly what you expect from the WD team! I gave a straight 5, because freebuild maps are all about terraining and such, and this map has too be the best one in SH when it comes to that. Honestly.